I built this castle for a gal who is leaving the company to go teach. In a past conversation Mary had wished she had cube walls around her desk but the powers that be wouldn't give her any. On her last day, today, I made her a portable cube shaped like a castle. It was part of the conversation. Here's Mary with her castle cube. Here's a shot with out the Shield of Knowledge. The whole thing is cardboard, duct tape, paint and hot melt glue. It took a couple of hours to build. It's completely portable and folds up for easy travel or storage. I found this short film at the Internet Archive. I wasn't looking for it and normally I wouldn't be looking in Home Movies but yesterday I was up in the middle of the night in one of those periods where you can't sleep but you can't read either. Sometimes staring at the monitor will put me to sleep. Until that happens I can surf the web. Occasionally I find odd things like this. In 1956 Robbins Barstow , his wife, and three kids all entered a contest put on by Scotch Brand Cellophane Tape. The prize was a free trip to Disneyland for 25 families. Disneyland had only been open for a year at that time. The youngest son Danny won the contest with his great slogan and the family all went to Disneyland. They got airline tickets and $300 to spend. Robbins used a movie camera and recorded all sorts of footage on the trip. In 1995 he narrated the edited film and some 5 years ago he posted it to the Internet Archive. In 2008 it was named to the National Film Registry by the Library Of Congress. The comments on the IA page for the film tell me Robbins passed away in 2010. His likeable homey narration will live on in an entertaining film about their magical trip to Disneyland. The amateurish film making in no way detracts, at least in my eyes. It's only 32 minutes and it's a delight to watch. You can also download the film at the link hidden in the post. I have come to believe it was about 1985 that I started to seriously buy some LEGO. The Basic Brick set 350 had come that year and I got 8 of them for about 12 bucks each. That gave me a nice start on some bulk. I started small, mostly just noodling around. It's the stuff you wouldn't take pictures of, and there wasn't anywhere to put stuff like that. I did take a a roll of 35 millimeter film and printed those pics. This is them, scanned, slightly cropped, with the brightness, color and contrast tweeked a bit. I started making buildings first, then it grew into a statement about uncontrolled building. In the world of those small plastic buildings the right to the air space above buildings gets sold and they build in it. The buildings don't have much detail, especially compared to the Micropolis type building, but that wasn't the point. I certainly didn't have much gray back in those days. It just wasn't as common as it is currently. It's kind of hard to see everything. The pics just aren't well enough lit and it's a pretty big lump of plastic. It was about 2 feet deep, 30 plus inches wide and more than 2 feet tall. The smallest buildings are supposed to be 3-5 story buildings, then bigger ones are built over them, finally the giant upside down U-shaped building gets tossed up. You can see more pics at Flickr. Funny how unexpected links pop up and lead you down an interesting road to a new surprise. I always say the more you know the more jokes you get. Erik Smit adapted a children's book to bricks and posted the story to Flickr. The Three Robbers by Tomi Ungerer is a 1961 illustrated children's book about some robbers that collect a vast treasure by robbin' coaches. Sounds like fun to me. During one robbery they find nothing in the coach but a small girl who's delighted to meet them. Rather than let he go off to live with her wicked aunt they take her with them to their hideout where they hoard their gold. She gets them to use their treasure to help orphan kids. The whole story is depicted in those 20 pictures above. I like the micro castle and town. The coach looks intriguing. Erik puts a link to a short 1971 film adaptation by Gene Deitch. The film was entertaining enough. He didn't mention it on Flickr so I am betting Erik might not know that Gene Deitch is the father of underground comic artists Kim and Simon Deitch. Kim is still producing entertaining comics of an oddly strange nature. 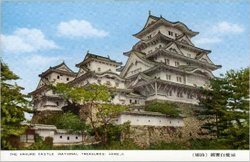 We were watching You Only Live Twice and there was an arial shot of this castle. 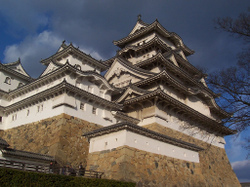 Himeji Castle is also know as Hakuro Castle. It appears in some of the Godzilla pictures. It was built in 1601 and is one of only 47 castles left in Japan. Here's some guys trip report which includes some nice pictures. Here's a virtual tour of the castle. More stuff here. There are ton of nice photos here. Parts of the lower castle structure remind me of the southwestern work by Frank Lloyd Wright. He was heavily influenced by Japanese architecture. This place has a nice slide show. The site is in Japanese but you can figure it out. Here's a papercraft version of the castle.